Finding out what time it is, is often as simple as looking at a clock. But when you need to know the time on another place on Earth, you also need to know in which timezone you are in. Timezones are a bit more complicated than the UTC-offset, or a timezone abbreviation (such as GMT or EST). In order to correctly identify a set of Daylight Saving Time rules (and other changes in UTC-offset) for a specific location you need to know its Timezone Identifier. These have the form of Europe/London or America/Indiana/Knox and any decent sysadm (and hopefully every developer!) will know what the Timezone Identifier for their specific area is. It becomes more difficult if you need to know the Timezone Identifier in a unfamiliar location, such as Indiana in the US, where there are eleven different identifiers. The `Olson Database`_ stores for each Identifier a region, but it does not record which geographical area is associated with that region. Eric Muller provides (ESRI) shape files containing that information through his website: http://efele.net/maps/tz/world/ . For each Timezone Identifier there are one or more polygons, where some polygons also have holes in them. In the case of Italy, that is to exclude San Marino and The Vatican for example but there are a few other examples as well. But we still need to go from a latitude/longitude pair to a Timezone Identifier. We use the extra argument timezone here to import it into a different MongoDB collection. Find the Timezone Identifier of the area that our current location points at. Select all areas that have the same Timezone Identifier. In the examples scripts, the center point's location is stored in the $center variable which is a GeoJSONPoint object. Its class is defined in https://raw.github.com/derickr/3angle/master/classes.php. My co-worker Jeremy Mikola has started on a GeoJSON library which I might start using instead of keeping my own (hacky) variant in the future. This is a GeoJSON structure that MongoDB's $geoIntersects operator uses. In this case, we try to find all documents in our collection that intersect with the center point, or in other words, find all the documents in the collection where the timezone polygon includes our center point. // Construct geo query for current center point. With the above two snippets we can now find the timezone, and hence the time, for the areas that cover land. However, the same timezone is valid inside the territorial waters that belong to that specific area. The territorial waters in general extend up to 22km off the coast. The downloaded shape files however don't cover the territorial waters and we hence need to find which shape, as contained in our documents in the MongoDB collection, is closest, but no further than 22km from our "center point". We could use $near for this, but instead I am using the Aggregation Framework to show that it is possible to calculate and return the distance as well. The aggregate() call in the above example includes three items in the pipeline: $geoNear, $sort and $limit. In the $geoNear step we query for all the documents near our center, with a maximum distance of 22000 meters. We only query for types 2 and 3 (ie. : no points) and we limit the result to 4 results. We add a new field d with the distanceField option and we use as distanceMultiplier 1. 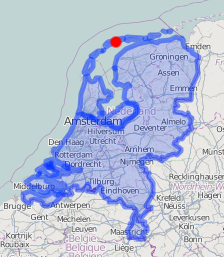 The multiplier is only needed in case you don't use a GeoJSON document, but instead use an old-fashioned latitude/longitude pair as argument to near. In that case you need to multiply by the radius of the Earth and divide maxDistance's argument by the radius of the Earth. In our case, we use a GeoJSON document so this is not needed. It is however required to use the spherical = true option. The second step ($sort) sorts by the newly added d field and the last step uses limit to restrict the result to just one document. 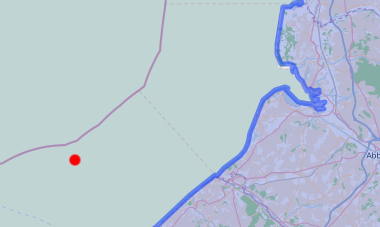 In this case the polygon that covers mainland France - which apparently has a hole in it. It also tells us that our point is 19065 meters away from the coast. From this output, we find out which Timezone Identifier was associated with the nearest polygon so that we can find all other ares with the same Timezone Identifier just like before. In the case even the Aggregation Framework query doesn't return anything we have to assume that we are not in territorial waters and we need to calculate Nautical Time. Nautical Time is the "ideal" timezone for a given longitude. Each each zone is exactly 15° wide. The Greenwich time zone runs from 7.5°W to 7.5°E longitude. Although not technically linked to UTC (but rather GMT or UT1), in my example I will be using Timezone Identifiers using UTC. If you want to learn more about UTC vs GMT vs UT1, see my article Leap Seconds and What To Do With Them. 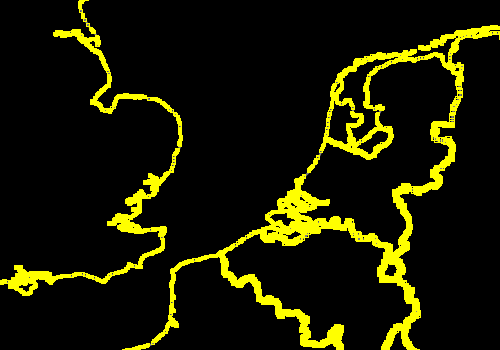 In a future version I would like to have all the timezones as shapefiles, including the territorial waters with regions and separate polygons for the Nautical timezones. Stay tuned for more!